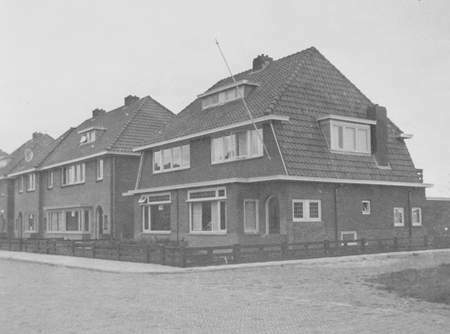 Anton was born at Dwingeloo on 1 December 1875, and was one of five children of Jacob Zaligman (Dwingeloo, 1840) and Roosje Heimans (Groenlo, 1839). Of the five children only Anton and his brother Benjamin lived in Meppel. Anton never married. He came to Meppel in 1905 and lived at 5 Noordeinde until 1936 and then moved to Concordiastraat. Behind his house was a garden that bordered on the garden of the Valentijn family, who lived on Westeinde. In Anton’s garden there was a ‘suikerboom’ (morrellenboom, a cherry tree). During the war everything was scarce, so he asked his backdoor neighbours: ‘If I give you cherries, can I get a sugar coupon in exchange?’ As the Valentijn family had no sugar coupon to spare, the exchange did not take place. Anton had been a textile merchant, but during the war he enjoyed his well-earned rest. As he did not have a wife to take care of him, Johanna Bertha Philip did the housekeeping. She was a daughter of his sister Jetje, who was married to Israel Philip and lived in Eibergen before they moved to Meppel. 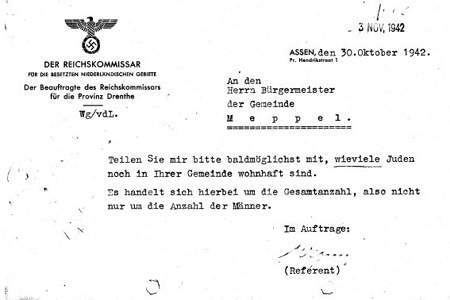 Not long before the Jews were picked up, she left Meppel. Johanna, her brother and parents were killed by the Germans; in Sobibor on 13 March 1943. Anton was a very nice man. Everyday he would come into the kitchen to have a talk. When the war progressed and the Jews had to wear the star of David, he did not dare to come anymore. He stood at the garden gate, and when I said to him: ‘ Please, come into the kitchen.’ he stepped over the gate and came inside. The jewellery was buried in the garden, but one day he had apparently dug it up again and brought the jewels to us: ‘Neighbour, these are for you’ he said: ‘I’d rather you have them, than that the Germans will take them.’ I was perplexed, but when my husband came home and said: ‘ We cannot accept them, these belong to Jews and will give us problems’, I gave them back to him. He came to Westerbork, but because he was sickly, he was immediately taken to the Wilhelmina Hospital in Assen. Was he pretending to be ill, or was he really ill? When they could not keep him in hospital any longer, the nurses said: ‘Mr Zaligman, you have to return to the camp. We cannot keep you here any longer.’ He then took a knife and cut through an artery in his arm and in this way he committed suicide. 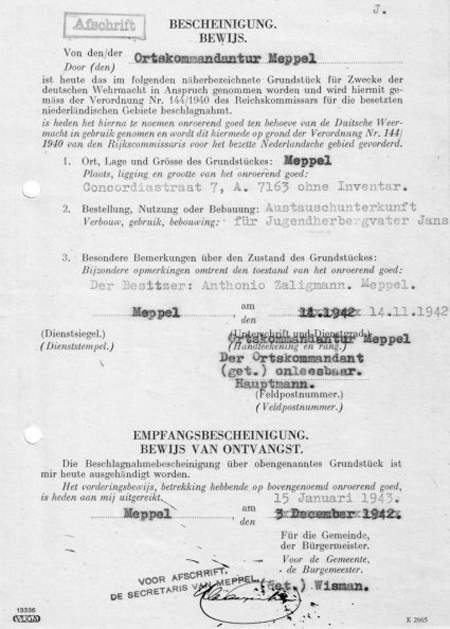 The contract stating that the house that Anton Zaligman had left, became available for Mr Jans. Zaligman died in the Wilhelmina Hospital in Assen on the morning of 19 October 1942 at seven thirty. At the Central Bureau for statistics the records show that Anton Zaligman committed suicide, alone, in hospital with a sharp tool. After his departure his house was let by the Algemeen Nederlands Beheer van Onroerende Goederen (General Dutch Management for Real Estate) to a man called Jans, warden of the youth hostel. He called on the neighbour’s wife Mrs Hartkamp one day and said: ‘Look what I have found in the shed behind a sack of coal: a bag of jewellery; what should I do with it?’ Mrs Hartkamp said: ‘You’d better hide it again.’ But he didn’t, he took it to the Germans. Recently it appeared that Anton Zaligman had rented a safe at one of the banks in Meppel. His safe was opened by force in 1942, by order of the Germans and its contents  securities, jewellery and other valuable objects  were taken out and disappeared. Anton Zaligman lived in one of these houses.